APPLICATION: The RLC2 is the ideal choice where levels are to be controlled from a single, or from multiple control locations, and visual level indication is desired. 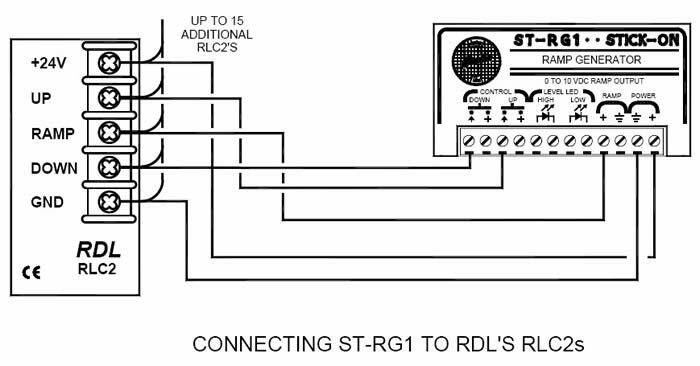 The RLC2 is designed to directly interface with RDL control modules, such as the STICK-ON® series ST-RG1 Ramp Generator, or RACK-UP® series RU-VCA2 Digitally Controlled Audio Attenuator. The RLC2 has two momentary pushbuttons, UP and DOWN. Pushing each button sends the appropriate signal back to the RDL control module. When connected to the RU-VCA2, pushing both buttons on the RLC2 simultaneously causes the level to return to the PRESET level on the RU-VCA2. 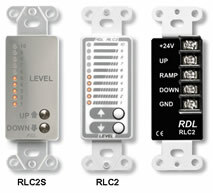 In installations where ULTRASTYLE™ wall controls are preferred, use the RLC-10R Rotary Level Control.